MOSIG lecture 1 is here. Lecture 2 is here. Lecture 3 is here. Mathematical modeling and control design in industrial and humanoid robotics. - Considering different priorities in control objectives. As discussed in Isaac Asimov's three laws of robotics, a robot is supposed to pursue multiple objectives, such as not injuring a human being, obeying orders, protecting itself, but there is a clear difference in priority between these objectives. Dealing with different priorities efficiently and reliably is an important aspect in the safety and autonomy of robots. I'm working on that. - Biped walking and balance control. Assuming that the perception of the robot is fine (I'm not working on that) and the robot knows its current situation in its environment, what decisions should it make to avoid collisions, keep balance and finally act as desired? I'm working on that as well. Some results include the walking and balance control algorithms in Aldebaran's Nao and Pepper robots. Dimitar Dimitrov : Post-Doc (2007, 2012-2015) on Optimization methods for robot control. Nicolas Cazy, PhD (2013-2016) on Visual Model Predictive Control in collaboration with Paolo Robuffo Giordano and François Chaumette (INRIA Rennes). Alexander Sherikov, PhD (2012-2015) on Model Predictive Control of humanoid robots. Jory Lafaye, PhD (2012-2015) on Model Predictive Control of humanoid robots in collaboration with Aldebaran Robotics. Saed Al Homsi, PhD (2012-2015) on Model Predictive Control of industrial robots in collaboration with Adept Technology. Zohaib Aftab, PhD (2009-2012) on Modeling of human balance under perturbations in collaboration with Thomas Robert (IFSTTAR), then joined University of Central Punjab. Andrei Herdt, PhD (2009-2012) on Model Predictive Control of a humanoid robot, then joined Dyson. Mehdi Benallègue, PhD (2009-2011) on Mirror controller: a bio-inspired computational approach for human walking motion imitation by a humanoid robot in collaboration with Abderrahmane Kheddar (JRL), then joined LAAS in Toulouse. Matthieu Guilbert, PhD (2004-2007) on Online optimization of complex robot applications under real physical limitations in collaboration with Staübli Robotics, then joined Adept Technology. Sophie Chareyron, PhD (2002-2005) on Stability analysis of non-smooth dynamical systems, with an application to walking robots, then joined Gipsa-Lab in Grenoble. François Keith, Engineer (2011) on the Romeo project, then joined LIRMM in Montpellier. Fabien Jammes, Engineer (2006-2008) on Inertial sensor based motion capture, then joined TracEdge. Rémy Mozul, Engineer (2005-2007) on the HuMAnS toolbox, then joined LMGC in Montpellier. Florence Billet, Engineer (2003-2005) on the HuMAnS toolbox, then joined CIC-IT in Grenoble. 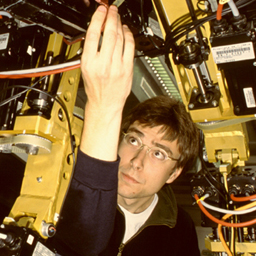 Sébastien Jardé, Engineer (2002-2004) on Advanced control laws for the BIP humanoid walking robot, then joined Dassault Systems.